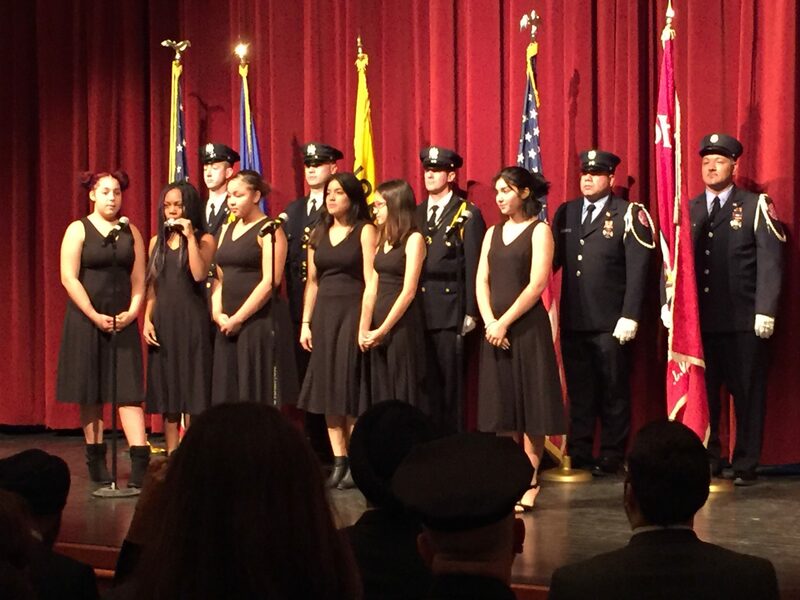 Hoboken High School's Select Chorus performed the national anthem. Rev. Elaine Ellis Thomas of All Saints Episcopal Church gave the invocation. 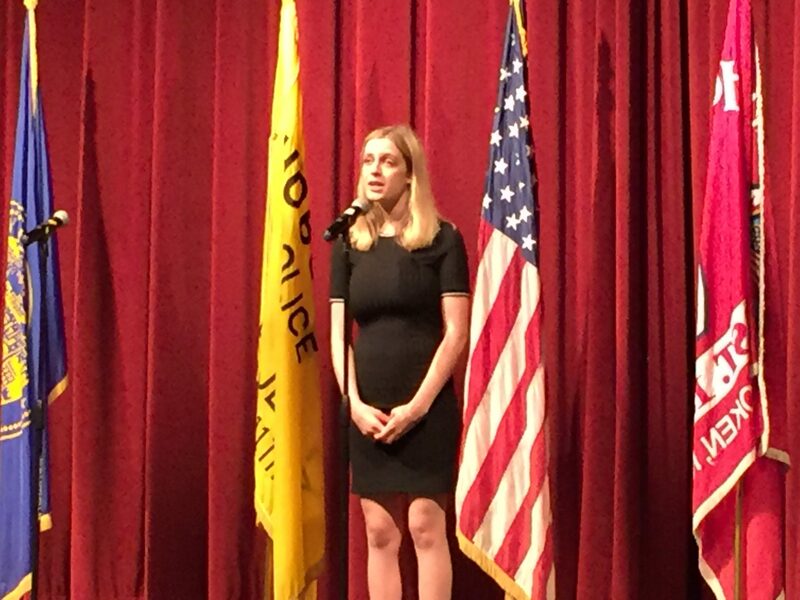 District student Sophia Melfi performed a song from the upcoming spring district wide musical "The Adams Family." Mayor Ravi Bhalla announced several new projects which will begin next year including a pedestrian safety plan, more open space, an a new agreement with Suez Water. 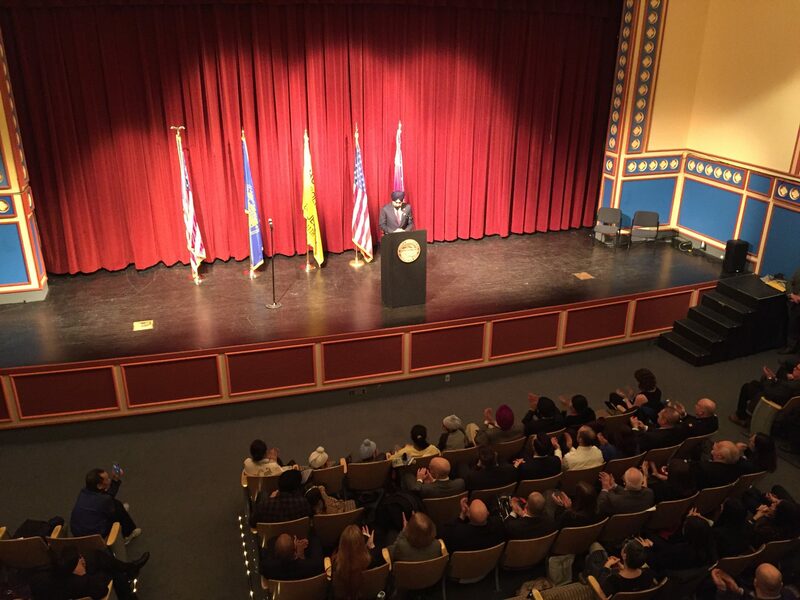 Mayor Ravi Bhalla gave his first State of the City address in front of elected officials and hundreds of Hoboken residents. 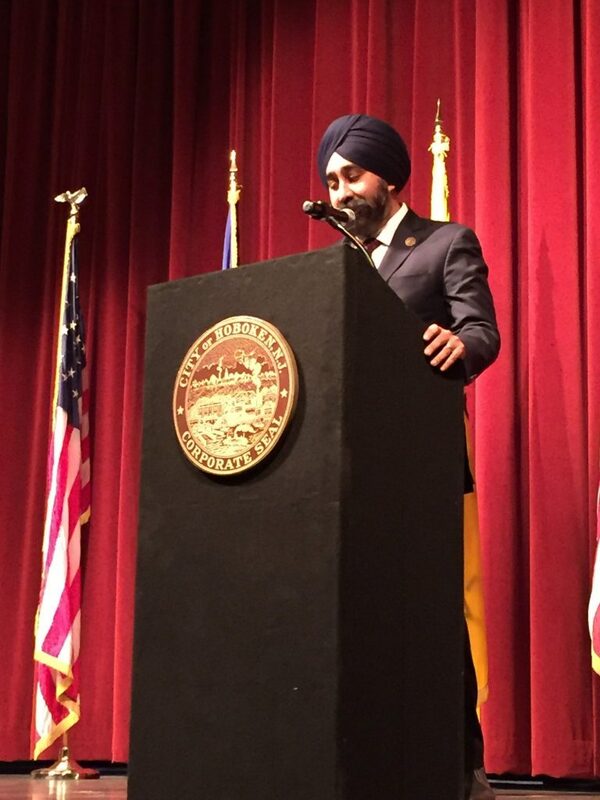 A new pedestrian safety campaign, more open space, and carbon neutrality by 2035 are just some of the new initiatives Mayor Ravi Bhalla announced during his first State of the City address on Tuesday, Jan. 29, in front of hundreds of residents and elected officials. 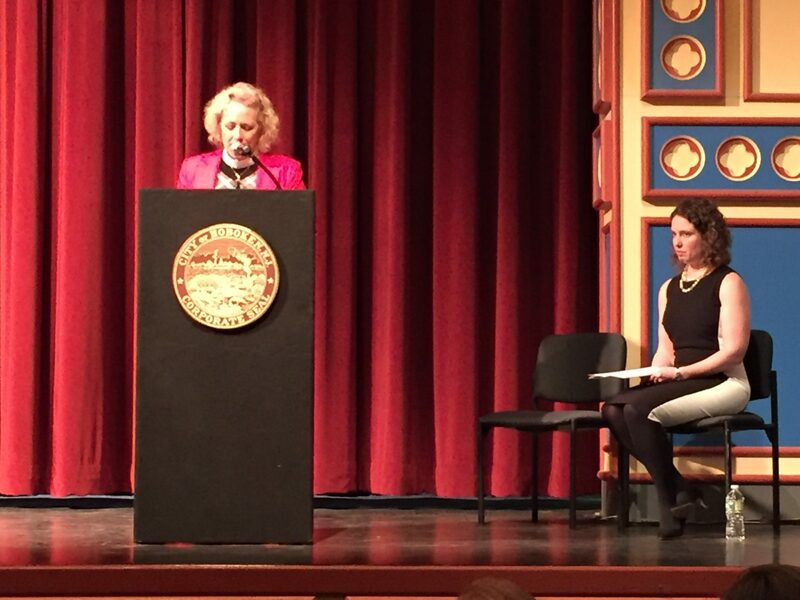 Initiatives also included a new contract with Suez Water that includes $33 million for water main upgrades, a new special needs and inclusive park, the Northwest Park, and more. He also reflected on his first year in office highlighting some of his administration’s accomplishments. Bhalla announced Hoboken Vision Zero’s pedestrian safety campaign that aims to eliminate all traffic-related deaths and injuries by 2030. He also signaled an impending new contract with Suez, the company that provides the city’s water, which he said will include more than $1.5 million in water main replacements every year and $33 million in water main infrastructure upgrades over the next 15 years. “The city will also directly invest an additional $10 million over a two-year span to replace the “oldest water mains in our system,” he said. Bhalla introduced Hoboken’s Climate Action Plan to help the city combat climate change. According to Bhalla, the plan calls for Hoboken municipal operations to become net zero by 2025 and carbon neutral by 2035 and for the city as a whole, to become net zero by 2030 and carbon neutral by 2050. The plan includes purchasing renewable energy for municipal facilities, the implementation of electric charging stations, energy-efficient building upgrades, and more. Hoboken will also continue to expand its open space according to Bhalla. It may also create a new Special Needs and Inclusive park. Bhalla said he hopes to approve plans for one in the coming year as well as incorporate inclusive elements into the current rehabilitation of Madison Street Park and the plans for the Northwest Resiliency Park, which should break ground this year. Bhalla said he was also excited about the city’s six-acre Northwest Resiliency Park, “Hoboken’s own Central Park,” which will begin construction in 2019 as well as expanding the Southwest park and acquiring the former Union Dry Dock facility. Next year he also said the city will finish the Washington Street Rehabilitation project and pave an additional 50 blocks of city streets. Bhalla also announced a new Special Improvement District will soon be established which will help build and grow the city’s small business community. “Special Improvement Districts have been a great success in other parts of the state, and I know it will become a game changer for our businesses and property owners alike,” said Bhalla. During the roughly 30 minute speech, Bhalla also recapped the past year’s progress as well as highlighted Hoboken’s schools, infrastructure upgrades, decreased crime rate, homelessness task force, plastic bag ban, and more. He said some of the steps the city has taken in the past year towards that vision include making sure Hoboken is an inclusive city, highlighting his executive order declaring Hoboken a fair and welcoming city, the creation of the city’s homelessness task force, expanding the budget and hours of the city’s tenant advocate, and scoring 100 percent on the Human Rights Campaign. He also highlighted the city’s recent agreement with KMS Development Partners which he said will help make more quality of life improvements in the city. The agreement includes nearly $5 million in givebacks by the developers to the community, including $1 million in infrastructure improvements, $200,000 to the Affordable Housing Trust Fund, roughly $400,000 dollars to the city’s charter schools, a $1 million endowment for the Hoboken Public Education Foundation, and $2 million to renovate the former YMCA. Other quality of life improvements also included the plastic bag ban and reopening the city’s Office of Constituent Affairs. Will Hoboken DNA test dog-do?